New York, USA -- The Korean art gallery at the Metropolitan Museum is a trim, tall, well-proportioned box of light. But it’s just one room, and a smallish one at that, reflecting the museum’s modest holdings in art from this region and the still scant attention paid to it by Western scholars. 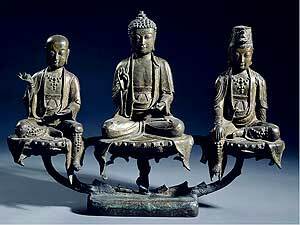 << An Amitabha triad from the 15th century. Change was the essence of Korea’s Choson dynasty, which was founded in 1392, and lasted for more than five centuries. It is the Buddhist art of the early Choson that gives the exhibition its flashes of color and spectacle. So no surprise that the expansive-sounding exhibition called “Art of the Korean Renaissance, 1400-1600” is, by Met standards, a small thing too, with four dozen objects. Most of them — ceramic jars, lacquer boxes, scroll paintings — are compact enough to be stashed in a closet. What the show lacks in grandeur, though, it makes up in fineness, and in rarity. All of the art dates from a period of cultural efflorescence and innovation in Korea. Experimental art was on the boil; utopian ideas were in the air. Yet much of what was produced then was lost in the series of invasions and occupations that began at the end of the 16th century. In short, while the number of objects gathered here, more than half on loan from Korean museums, isn’t large, it’s a lot of what survives. And anyway, it makes for a comfortable display, ideal if you’re in the mood for some close looking rather than a drive-through blockbuster sweep. Change was the essence of the Choson dynasty, which was founded in 1392, around the time the Renaissance began in Europe, and lasted for more than five centuries. Choson means “fresh dawn,” and the dynasty perceived itself as a broom sweeping the country clean of tired old ways, which in its early phase it did. The end of the 14th century was a heady time in East Asia. In 1368 China finally rid itself of Mongol occupiers and established the Ming dynasty. In the process it revived neglected art traditions and asserted neo-Confucian thinking, with its concepts of philosopher-kings, government by scholar-officials and a code of ethics based on loyalty to state, community and family. Three decades later a similar shift happened in Korea. An old governing aristocracy was pushed aside to make way for a state-trained bureaucratic elite known collectively as yangban. Institutional Buddhism, a political and spiritual force for the better part of a millennium, was officially suppressed in favor of Confucian secularism. As in China, traditional art forms were revived and revamped to convey new meaning. But history is rarely cut and dried. As often as not, it’s a story of coexistence, not replacement; of retreat, not defeat. So it was in Korea. Buddhism didn’t go away. Like a pilot light on a stove, it may have been hard to see, but it kept burning, its flame sustained primarily by the ruling elite that had banned it. And it is Buddhist art of the early Choson that gives the exhibition its flashes of color and spectacle. A large hanging scroll painting of the Healing Buddha, his skin gold, his robes purple, his throne wreathed by a tangle of celestial bodyguards, is especially magnetic. It looks both old and new. Prototypes for it go back centuries in China and Korea, but details of the Buddha’s persimmon-shaped face — the tiny slit eyes, the beanlike mouth — blend Choson and Ming styles, making the painting very much of its 16th-century time. It was of its time too in being both illegal and a royal commission, paid for by an avidly Buddhist dowager queen whose son was a neo-Confucian king. It was China, rather than Buddhism per se, that provided Korean artists with an aesthetic template. Sometimes cultural differences are all but impossible to discern. A magnificent picture of a falcon, long attributed to the 14th-century Chinese animal painter Xu Ze, has recently been reattributed to the 16th-century Korean painter Yi Am, partly on the basis of a seal stamped on the picture’s surface. In a set of Korean hanging scrolls titled “Eight Views of the Xiao and Xiang Rivers,” the seasonal theme, the ink medium, even the landscapes are all classically Chinese. But the painter’s elevated perspective, as if seeing the world from a balcony in the clouds, is not. Drawn as it was to China, the early Choson dynasty was also intent on defining and promoting Korean-ness. In 1443, in the reign of King Sejong, a committee of court scholars invented and made public, for the first time, a Korean phonetic alphabet and script called Hangul, ending the country’s long dependence on Chinese as a written language. From that point, fulfilling a neo-Confucian ideal of universal education, reading and writing became common. An industry of books in Hangul flourished. In a beautiful painting of a Buddhist narrative in the show, lines of white-painted Hangul script trickle down like curtains of soft rain. The tale depicted seems to be one invented in Korea, and certain forms of art are specifically Korean in content or style too. One type of painting — there are three examples in the show — is the equivalent of a class-reunion photograph of government bureaucrats who had taken their rigorous civil-service exams in the same year. In each picture the men, often elderly, attending the reunion are portrayed enjoying one another’s company in breezy pavilions, with their names, biographical updates and occasional sentiments (I’m still working hard, I miss so-and-so, old age is hell) written below in Chinese. Many identical paintings were made so that each scholar could carry home a souvenir. The most distinctively Korean art forms were developed in ceramics, specifically in the stoneware now called buncheong. At the start of the Choson era buncheong was the luxury ware favored by an elite clientele. Its novel refinements are evident in the show in a set of funerary dishes, replete with an inscribed memorial tablet, covered with feathery white crosshatch patterns stamped on a gray-brown background. On loan from the Samsung Museum of Art in Seoul, South Korea, the set is, for obvious reasons, registered as a national treasure. After a few decades court-controlled kilns began to turn out a rival product, an exquisite white porcelain that quickly became, in aristocratic circles, the thing to have. Buncheong, its prestige diminished, passed into the general market. Maybe because of its release from the restraints of class decorum, this stoneware became the fantastically zany art that it is. Based on squat everyday items like water flasks and baskets, buncheong forms tend to look squashed and bashed, their glazes slathered and spattered on, their surfaces dug-into and scarred with abstract scribbles like those in a Cy Twombly painting. Buncheong was a hit, but by the end of the 16th century it had more or less ceased production. A lot of art started to disappear. In 1592 a Japanese army attacked Korea and stayed to loot and pillage; Buncheong potters were shipped back to Japan to make tea-ceremony wares. Some 30 years later the Manchus invaded Korea for the first time on their way to conquering the Ming dynasty in China and setting up one of their own, the Qing. For practical reasons the Choson court declared fealty to the Qing. At the same time Korean artists and scholars pondered, more intently than before, the lineaments of Korean culture — what it was, had been, could be — and turned their hands to advancing a national art. The story of the later Choson exceeds the compass of the show but will likely be tackled later. The Met plans to mount a series of exhibitions over the next 10 to 15 years on the history of Korean art. Each show will be about the size of this one and accompanied by a catalog, the first of which — solid, slender and edited by the present show’s organizer, Soyoung Lee, an assistant curator in the department of Asian art — has appeared. Exhibitions of this scale could become a new norm for the Met in the years ahead. If so, great. When they are well done, small shows deliver everything a memorable art experience needs: beauty, history, unfamiliarity, deep research and fresh ideas. And they do something bigger shows cannot: turn major cultural encounters into intimate conversations. “Art of the Korean Renaissance, 1400-1600” remains at the Metropolitan Museum of Art through June 21; metmuseum.org.